Guests of the PodHotel stay in (what else?) a PodHouse, a prefabricated micro-home developed by ROB GmbH . The company’s original intent when designing the PodHouse was to create environmentally-friendly shelters — garden rooms, backyard offices and the like. The PodHouse’s modular design makes them adaptable to a variety of needs. Including, as it turned out, a backwoods vacation spot. 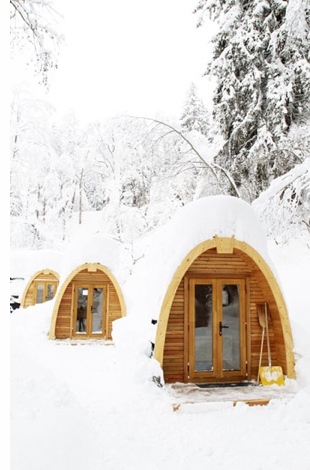 The PodHotel consists of three PodHouses located in an idyllic woodsy gully outside of Flims, Switzerland. The pods are located only a few meters apart from each other, a bummer for those seeking a secluded feel. The interior of the pods, however, are as cozy as can be. The pods have heat and a small light (powered by a solar-charged battery). Each has room to store your belongings and two beds (three in the FamilyPod) and that’s pretty much it. Among the things you won’t find inside your pod accommodations: a sink, shower or toilet. 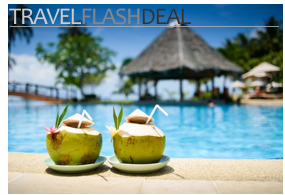 Those are located inside the main PodHotel building along with a communal kitchenette and wifi internet access. 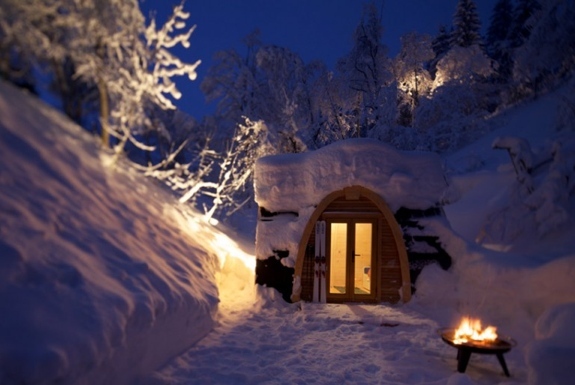 The PodHotel is open year-round, but there’s something especially amazing about it in the winter when the PodHotel Flims is under a heavy blanket of snow. Check out the photos below. And stay warm. Wow. I love this unique inn. I wanted to experience that as well.